Posted on August 8, 2014 by Mark Pajor. For researchers and students interested in power and energy, the photovoltaic array atop the Electrical and Computer Engineering Building is perhaps the department’s most visibly different space from the facilities in Everitt Laboratory. But it isn’t the only one. ECE ILLINOIS is enhancing the power and energy lab experience. The power area’s instructional lab, the Grainger Electrical Machinery Laboratory, recently received an upgrade, providing undergraduate students with better equipment. The Advanced Power Applications Laboratory will give graduate researchers direct access to the building’s solar panels, offering them chances for hands-on renewable energy research. And a new lab will join them: the Design Annex, a space where undergraduate students can perform research and work on projects that emphasize power and energy. The Grainger Electrical Machinery Laboratory is tied to specific senior-level courses, such as ECE 431, Electric Machinery, and ECE 469, Power Electronics Laboratory. Earlier this year, the lab upgraded its benches. The lab has new oscilloscopes, power sources, and meters, and each bench has a coupled motor-generator for motor and generator experiments. Now, that equipment has a new home in the ECE Building, where there is far more space for it. 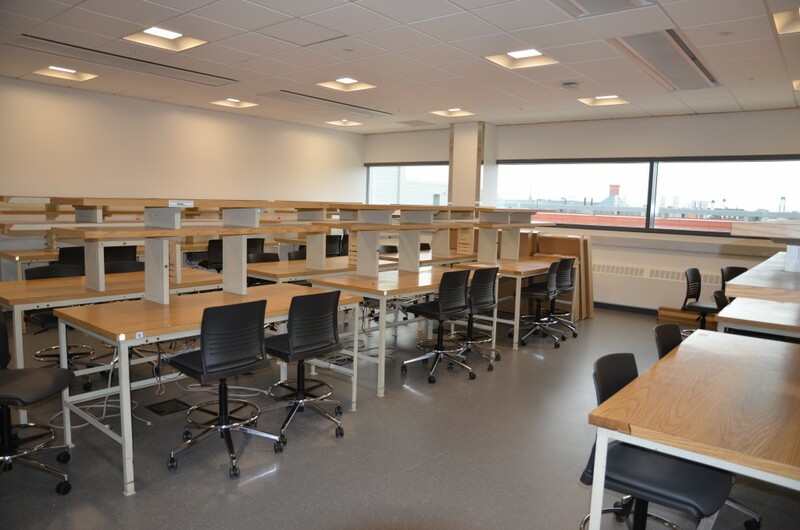 The size of the laboratory room itself is now larger, it has a dedicated service space for benches, and it is attached to an adjacent classroom. The lecture portion of laboratory courses can occur in the classroom, and the students can then walk directly into the lab. Assistant Professor Robert Pilawa-Podgurski noted that, with the larger lab space, ECE ILLINOIS can accommodate more students interested in power and energy. Professor George Gross added that the lab is instrumental in helping students understand the applications of the concepts covered in class. “In terms of teaching purposes, we have some of the best power labs in the world,” he said. A photo of the Design Annex. In Everitt Laboratory, the research spaces for power and energy were dispersed across multiple rooms, making it difficult to operate. Taking advantage of the photovoltaic array atop the ECE Building, graduate student researchers in the Advanced Power Applications Laboratory will have direct access to the roof where the solar panels will be placed. “The goal is to get the students to experiment with solar. A portion of the array will be directly hands-on,” Pilawa said. Gross added that solar energy is perhaps the fastest-growing segment of renewable energy resources, and hands-on work with solar energy technology on a large scale is an invaluable experience for young researchers. One of the ECE Building’s all-new lab spaces is the Design Annex. This new lab will offer undergraduate students a space for research and senior design projects that have a primary emphasis on power and energy. The new lab will provide the equipment that undergraduates need for their research and projects, as well as the support to use that equipment. “We have a dedicated hardware engineer, Kevin Colravy, who manages a lot of the undergraduate research teams and provides lab support, to find all the right equipment students need to do their work safely,” Pilawa said. Once the solar panels have been installed in the fall, students in all three of these lab spaces will look out the windows to the roof and the photovoltaic array – an example and symbol of what can be accomplished with state-of-the-art energy technology. “It’s an exciting time for students who are interested in power and energy,” Pilawa said.